Fisher Price Laugh & Learn Dance & Play Puppy is a four legged friend full of fun. It helps children dance and learn at the same time. As it wiggles its tails, the puppy will recite letters to excite your tot and encourage imitation. Why You'll Love It: Develop important language skills with this playful puppy. Let your children dance and play games with their favorite new playmate, Dance and Play Puppy from Fisher-Price's Laugh and Learn toys. Dance and Play Puppy guides children through their first experiences with motions and games while simultaneously teaching them how to count and how to recognize the alphabet. 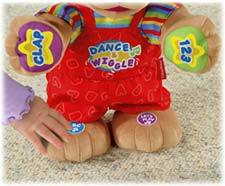 Encourages baby to clap, wiggle & dance along! View larger. Press either foot to start the fun! Dance and Play Puppy features two modes of play to help your baby learn while having fun. Songs, phrases, movements, and games occur in both modes, helping your baby learn without even realizing that practical skills are being acquired. On Puppy's right foot is the "ABC" mode, which is activated by pressing the blue "ABC" disc. Puppy will help guide your baby through motions, letters, and numbers, fostering language development and teaching how to follow directions. On Puppy's left foot is the "Let's Play" mode, and when you press the purple disc on his foot, he'll come to life with baby-friendly motions, lively songs, and that irresistible puppy wiggle! As Dance and Play Puppy guides your baby through easy-to-follow motions, he will also make fun, surprising movements. His ears will sometimes move up and down as he sings, adding an extra level of engagement to both modes of play. While some movements engage by surprise, others are familiar. Our product designers included a pat-a-cake mode because it is often one of the first motions parents teach their babies. Familiar songs were also included in Puppy's 25-plus interactive songs, phrases, and games, such as "Happy and You Know It," "Do Your Ears Hang Low," the "Alphabet Song," and more! He'll also blow kisses and teach parts of the body, manners, and greetings. Assembled toy, six AA batteries, and instructions.